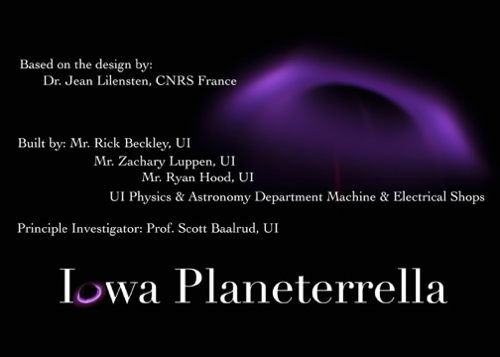 The “Iowa Planeterrella” was built at the University of Iowa in 2015-2016. 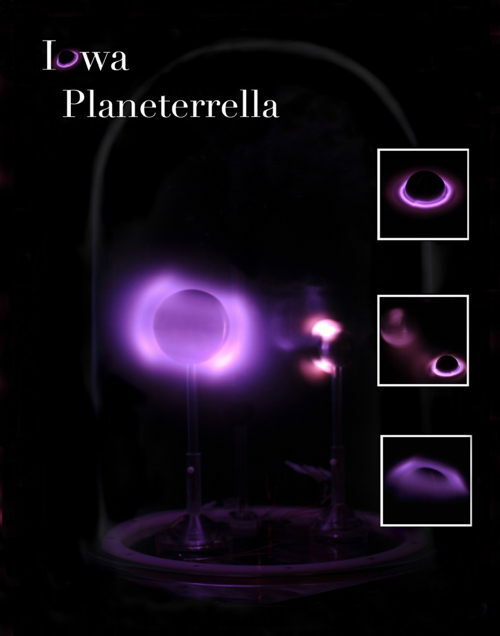 It follows closely the Planeterrella design provided by Dr. Lilensten. Three modifications were made so that it could be incorporated into a museum exhibit. The first is an electronics switchboard that allows users to switch between different configurations by turning a knob (currently these are the radiation belt, aurora and ring current demonstrations). The second is an automated pressure control that maintains the pressure inside the device between a set range of values. Third, a clear Plexiglas box covers the bell jar so users cannot disturb it during use. These modifications have enabled the device to be used by anyone without supervision. The University of Iowa has long played a pioneering role in the exploration of space. It was here that James Van Allen worked to discover Earth’s radiation belts. The Iowa Planeterrella seeks to engage audiences in not only the physics of space, but also in the history of the state. 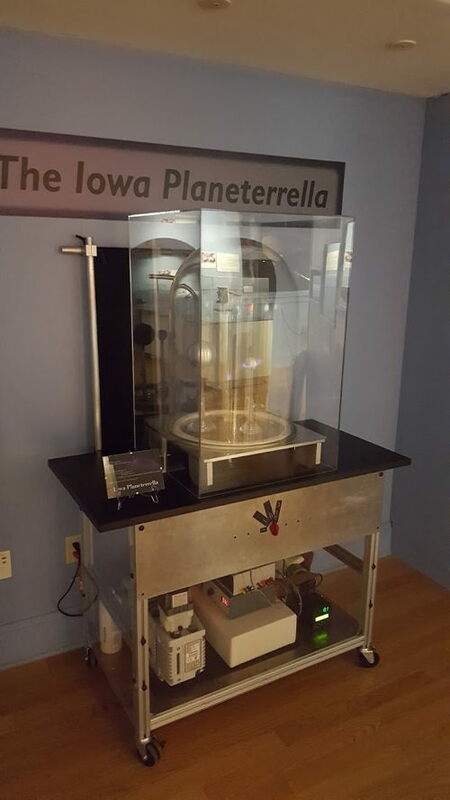 Currently residing within the Old Capitol Museum on the University of Iowa campus, the Iowa Planeterrella is part of a broader exhibit “Hawkeyes in Space: UI Physics, Plasma and Present”, which explores the history of the school’s space programs and work with NASA. After the Iowa Planeterrella leaves the Old Capitol Museum in June 2017, it will be available for schools and educational demonstrations. The Iowa Planeterella was constructed entirely by students. Master’s student Mr. Richard Bleckley and PhD student Mr. Ryan Hood constructed the base device in 2015. Undergraduate student Mr. Zachary Luppen modified the device to adapt it to the needs of the museum exhibit in 2016. The construction of the Iowa Planeterrella was supported by the US National Science Foundation under grant No. PHY-1453736. Any opinions, findings, and conclusions or recommendations expressed in this material are those of the authors and do not necessarily reflect the view of the National Science Foundation.